Preheat oven to 350 degrees. Spray a 8 1/2 inch by 11 inch baking dish with Pam cooking spray. Peel and core apples. Slice them about 1/4-inch thick. 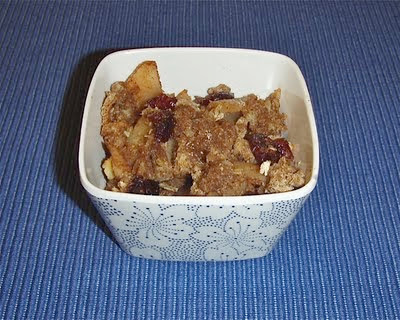 Place apples in a bowl with the corn starch, cinnamon, nutmeg, all spice, and cranberries. Mix well and arrange the mixture in the baking pan. Combine flour, brown sugar, Splenda, salt, rolled oats, and cinnamon. Add slightly-softened butter until mixture is crumbly. Arrange butter crumble mixture atop apples until it's evenly coated. Bake for 45 to 50 minutes. Serve with ice cream (if desired); OR for a lower-point dessert, add 2 Tbs lite cool whip or 1/2 Tbs fat-free Smucker's caramel sundae syrup to each serving. Enjoy! If you'd like a printer-friendly version of this recipe, Click Here. If you add 2 Tbs of lite cool whip or 1/2 Tbs Smucker's caramel sundae syrup, the total points per serving is 2.5.